For many of us of a certain age, our family Christmas season officially began with the showing of A Charlie Brown Christmas or Rudolph The Red-Nosed Reindeer. In those pre-on-demand days, my family would use the TV Guide to plan ahead and mark our calendars. This year’s release of The Star, opening tomorrow in theaters nationwide, marks the addition of a new “Christmas classic” for families that’s sure to delight and inspire. The premise of The Star is genius! We are treated to a biblically-inspired retelling of the nativity story from the perspective of the animals who were present alongside Mary and Joseph at the birth of baby Jesus. As one who loves a good story and who also wrote a creative book on Christmas, I watched The Star with an eye towards reverence for the “original”. Not only was I not disappointed or concerned, but I was truly delighted. Director Timothy Reckart and screenwriter Carlos Kotkin have crafted a thoughtful, inspiring narrative while giving agency and voice to those animal figures you and I lovingly place in our nativity scenes each year. Present here are the donkey, the sheep, the dove, the camels, the cow and the horse who look upon the manger in my family’s nativity each Advent, awaiting with eager anticipation the coming of the Christ Child. 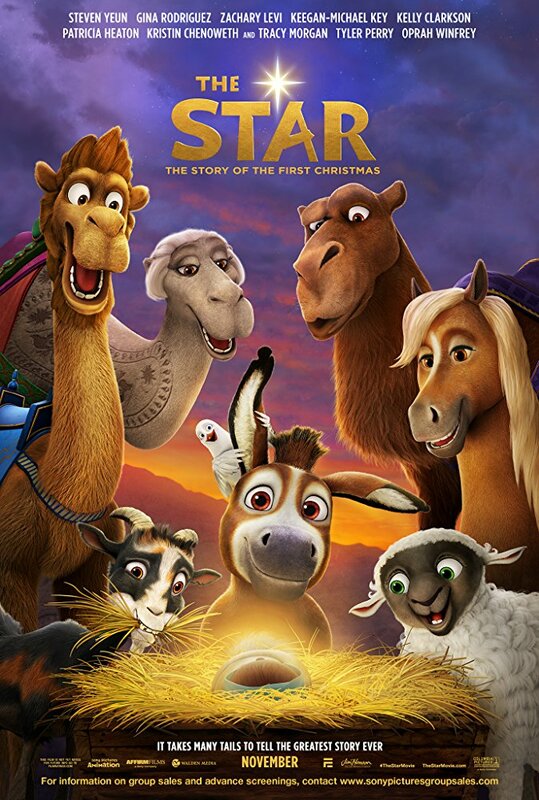 In The Star, these animals, voiced by an array of talent, come to life and invite us into the gospel story with joy, courage, perseverance and an unmistakable sense of mission. Certainly, any Christmas story must “star” Mary and Joseph. The Star is illuminated by spirited performances by Gina Rodriguez and Zachary Levi, who never play second fiddle to their animal counterparts. Rodriguez’ Mary translates Our Lady’s fiat with reverence and sincerity, but also with a verve which pays proper tribute to the audacity of Mary’s yes. Zachary Levi’s Joseph must build upon his voiceless biblical presence. Levi succeeds in giving us a Joseph who is the perfect helpmate to Mary, trying to control an untenable situation and finally giving himself over fully to God’s grace and care. But the true fun and genius of The Star are the various animals who recount for us the “rest of the story” of Jesus’ coming. 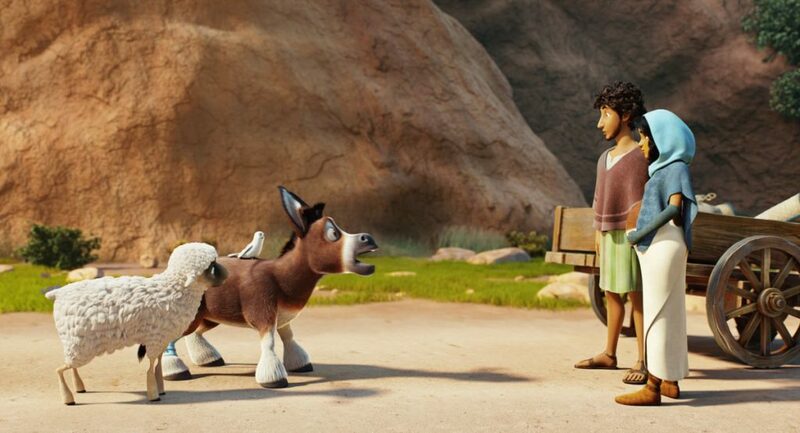 Bo the donkey, voiced perfectly by Steven Yeun, dreams of escaping his humdrum job grain-mill job and one day joining the famous royal caravan. His counterpart, the often sassy Dave the dove (voiced by Keegan-Michael Key) is Bo’s partner in a daring decision to break loose and follow their dreams. A hilarious turn of events lands Bo in Mary’s care and ultimately at Mary and Joseph’s side for that oft-told journey to Bethlehem. Along the way, we meet the wise men–but more notably their camels–who are voiced by three of the veritable who’s who cast. Oprah Winfrey, Tyler Perry and Tracy Morgan’s involvement as said camels points to a cast who were all anxious to be a part of a faithful but also fun reminder of why we celebrate this holy season. In my interviews with cast and crew (to be highlighted here tomorrow), I was moved by the desire each actor professed in being true to the mission of this film, to tell the story of the first Christmas for new generations to come. © 2017 CTMG, Inc. All Rights Reserved. **ALL IMAGES ARE PROPERTY OF SONY PICTURES ENTERTAINMENT INC. FOR PROMOTIONAL USE ONLY. SALE, DUPLICATION OR TRANSFER OF THIS MATERIAL IS STRICTLY PROHIBITED. Concerned parents may want to know if it’s ok to take young viewers to a film that takes such an innovative approach to such precious source material. In my mind, only you can answer that question. For myself, I absolutely can’t wait to take my loved ones to see The Star. There are most definitely a few very gentle “potty talk” moments I could have done without, but I know my nephews well enough to know that they will roar at those lines and that they are far outside the realm of ever disrespecting the story of Jesus. Additionally, parents of very young children will want to know about the involvement of Thaddeus and Rufus (Ving Rhames and Gabriel Iglesias), two of Herod’s (Christopher Plummer’s) evil dogs who are on the hunt for the messiah foretold by the Magi. There are a few action-packed chase scenes and scary moments involving the dogs that may frighten little ones. It is these moments that earn the film its PG rating. In their review, Catholic News Service classifies The Star as A1 – general patronage. Complimenting fine voice acting, The Star also wins as a delightful Christmas experience because of a wonderful soundtrack including a new original carol by Mariah Carey. I loved how seamlessly beloved Christmas classics were blended into the action. The score is the perfect partner for delightful art by Sony Animation. Catholic viewers will definitely want to check out a phenomenal companion resource to the film that has been meticulously and beautifully crafted by the National Conference for Catechetical Leadership. This FREE, 39 page downloadable resource includes prayer tools (such as a Blessing of the Nativity Scene), scripture references, faith-sharing tips, journal prompts, reflection questions and much more to make this movie a beautiful gift for families and classrooms this Advent season. Tomorrow, I will be sharing a few insights from my interviews with the cast and crew of The Star. I look forward to hearing from you once you’ve had a chance to see The Star! Official website for The Star – Includes animated coloring book, printable dioramas, coloring pages, mazes, connect the dots, where’s Bo activity, character cards, printable holiday cards and more. Catholic Curriculum from National Conference for Catechetical Leadership – This six-part curriculum explores key elements from the first Christmas and everyday life, including: prayer, friendship, divine providence, vocation, the Christmas story and Las Posadas. Watch special movie clips from THE STAR as you learn how the characters helped each other and followed God’s destiny for their lives. Each lesson is packed with prayer, activities, Scripture, faith-sharing questions and times of reflection. Images © 2017 CTMG, Inc. All Rights Reserved. **ALL IMAGES ARE PROPERTY OF SONY PICTURES ENTERTAINMENT INC. FOR PROMOTIONAL USE ONLY. SALE, DUPLICATION OR TRANSFER OF THIS MATERIAL IS STRICTLY PROHIBITED. My husband and I saw the screening of “The Star” this past Monday evening. We got complimentary tickets from Relevant Radio. It was FANTASTIC! I was blown away by the magnificent animation and the fun and faithful antics of the characters. The sound track was amazing as well. Wonderful songs and the voices of the celebrities were perfect picks. We are taking our grandkids (8, 7, 5 and 4) to see it the Saturday after Thanksgiving. What a wonderful Christmas movie and it will be a favorite for our family for many, many years to come! Bravo!!! !